I’m really enjoying this issue of Time Magazine. Bryan Walsh’s recent cover story in Time Magazine exposes the conspiracy to slander FAT in the last four decades of nutritional science. In 1980, the year I was born (thought you might want to know that), the USDA published dietary guidelines that warned Americans to stay away from fats and cholesterol in order to reduce the risk of heart disease. They advised Americans to cut back on meat consumption, stop drinking whole milk, and replace our traditional eggs and bacon with “healthy” grain-based cereals and low-fat milk. 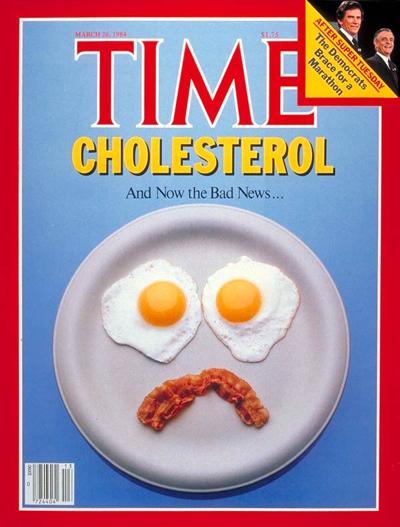 Cholesterol was blamed for heart disease and foods high in fat were put on the hit list. Notice this Time Magazine cover from 1984. But not everyone was convinced. Philip Handler is quoted as being skeptical about these guidelines from the very beginning calling it “a vast nutritional experiment”. Well, this experiment has gone very badly. According to Walsh the prevalace of Type 2 diabetes increased 166% from 1980 to 2012. More than a third of Americans are obese which makes us one of the fattest countries in the world (which country is fatter?). And what’s ironic is that conventional wisdom told us that cutting fats out of our diet would help us lose weight. Cut fat to lose fat, they thought. I recommend reading Brian’s entire piece if you have time. He surveys the history behind the vilification of fat and how the USDA’s guidelines were based on faulty research. Dr. Ancel Keys, who developed the K-ration, theorized that cholesterol clogs arteries. Keys conducted a study known as the “Seven Countries Study” comparing the American diet to seven other countries with lower rates of heart disease. Key’s study became foundational for future studies in heart disease -referenced almost 1 million times. In 1977 the McGovern Committee led by Senator George McGovern published its “Dietary Goals for the United States” telling us to eat less fat and consume more carbohydrates. In 1992 the USDA released it’s famous Food Guide Pyramid recommending up to 11 servings a day of grains and only 2-3 servings of meat, poultry, fish, dry beans, eggs and nuts. In 2011 the government revamped the food pyramid into MyPlate, still recommending lots of grains. Meanwhile, the food industry lined store shelves with products marketed as “low fat” and “made with healthy whole grains”. High fructose corn syrup found its way into almost every processed food we eat. Americans did what they were told and cut back on meat, eggs and dairy but started consuming more calories per day -often from processed foods. Obesity and diabetes reached epidemic levels. He cherry-picked his data, leaving out countries like France and West Germany that had high-fat diets but low rates of heart disease. The idea that fat is bad is starting to unravel in the nutritional health community. Diets high in refined carbs are the real killer. Carbohydrates are converted into sugar by the body. Then insulin is released to deal with the sugar surge, which it does by storing any excess calories (energy) in fat cells therefore causing you to gain weight. Since most of us are not as active as we should be, the calories are being stored not burned and you all too soon become hungry again. I predict that within a generation the food industry will turn an about-face and we will see products marketed as “high in healthy fats”, “yummy fats for a growing family”, and “made with real butter”. Maybe you’re still leery about eating more fat in your diet. Saturated fat has been demonized for so long in the U.S. and elsewhere that it could be hard to change our paradigm. First, I suggest you start by doing some reading. Angie and I first started seeing the bennefits of a high fat / low carb diet after reading Vinnie Tortorich’s book Fitness Confidential. We were also helped along in our journey by reading Gary Taubes, Why We Get Fat; The Ben Greenfield Fitness Podcast; the work of Dr. Tim Noakes, and several other books. Next, if you find the arguments for fat convincing, take some intentional steps to transition away from refined carbs. If it comes in a box or vacuum sealed package don’t eat it. If it contains high-fructose corn syrup don’t eat it. If you don’t understand the ingredients don’t eat it. We recently interviewed ultra-marathon man Dean Karnazes for MTA podcast episode 112. His own nutritional philosophy is “eat nothing processed”. This includes all things made from wheat since wheat must be processed before being consumed. Then, start eating more healthy fat. Remember, fat does not make you fat. (This does not hold true for trans fats which should be avoided like the plague). It’s been almost a year since we transitioned to keeping our bodies in a fat adapted state -that is, relying primarily on fat not sugar as fuel. We have made healthy fats like avocados, coconut oil, olive oil, nuts and salmon a staple in our diet. I unashamedly put heavy whipping cream in my coffee every morning. We eat egg yokes with impunity. We switched our breakfast foods from waffles, oatmeal and cereal to eggs and grapefruit (and bacon on Saturdays). Today I can walk by the bread and cereal isle without thinking twice. I used to be a big lover of sugary granola. We have continued to eat generous amounts of fresh fruits and vegetables. Like our ancestors we eat meat almost every day with extra veggies standing in for the grains we formerly ate. We keep processed foods at bay except for some occasional snacks that the kids enjoy. Angie and I have been very pleased with the results of fueling our running and everyday life with healthy fats. I’m glad the greater public is waking up to this movement. Thank you Brian Walsh for getting the message out. For those transitioning away from grains, Angie’s Fat Adapted Eating Plan will help you learn to reduce your dependence on processed grains and sugar and burn your body’s fat as fuel. All this blog writing is making me hungry!